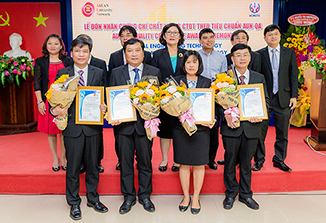 Conference on "Fostering the university - enterprise cooperation in the digital age"
In order to improve the cohesion between the university and enterprises, research and technology transfer, providing technical solutions, creative new ideas, promoting startup entrepreneurship in the student community, providing human resources for realistic projects, on the morning of May 9th, 2018, Ho Chi Minh City University of Technology and Education (HCM UTE) organized a workshop on " Fostering the university - enterprise cooperation in the digital age" at the meeting room 2 with the participation of representatives of 39 companies, organizations and enterprises along with other delegates. On behalf of the university, there were the presences of Assoc. Prof. Do Van Dung - Secretary of the Party Committee, President of the university, Assoc. Prof. Ngo Van Thuyen - Chairman of the university council, and Dr. Truong Thi Hien - Vice President of the university. Ho Chi Minh City Business Support and Development Center (HCM BSDC) was represented by Mr. Le Minh Trung - Director of HCM BSDC. While giving the opening speech and orienting the discussion, Assoc. Prof. Do Van Dung - Secretary of the Party Committee, President of the university initially mentioned the achievements of teachers and students of HCM University of Technology and Education in the previous year. Typically, the latest graduation rate of the university indicated that 60% of the undergraduates already had a job, 96% successfully got a job after six months of graduation, and the university was always in the top of universities having the highest graduate employability ranking in Vietnam. One of the main reasons was due to the interest of business enterprises for students and the university through seminars, introduction of internships, job fair. He said: "In the era of the Industrial Revolution 4.0, enterprises often attach special importance to students' creativity and problem-solving skills. In line with the era, the university also refreshes the field of enterprise cooperation in order to jointly renew the training program in response to the practical circumstance while emphasizing the cooperation in organizing training outside the enterprise in time to come, and intent to maintain a long-term cooperation. In the speech about the operation of Enterprises Relations Office and the university in connection with enterprises in the past period, Ms. Tran Thi Thu Huyen - Deputy Head of Enterprises Relations Office of HCMUTE clearly stated the main activities of the department from 2014 up to now were: "Recruitment- Employment activities; Organizing Soft skill classes, professional seminars; Connecting with enterprises; Field trips and sponsorships ", v.v has brought great impacts and achievements. Highlighted in the speech was that HCMUTE was the first university to hold “Recruitment week” twice a year at the graduation period of students with the participation of 55 enterprises per year. Continuously organizing professional seminars, soft skills based on enterprises' and students' assessments to invite professional experts in each field to share the specialized skills needed to assist learning and later work. Representing Science and Technology Department of HCM UTE, M.A. Le Tan Cuong mentioned technology research and technology transfer activities of the department to enterprises from ideas to production activities assisting companies and enterprises made breakthroughs in the information age. Since the success of this activity together with the scientific researches of students and lecturers in the university, from 2012 to now, the university has established 12 research focus groups to promote the potentials and strengths of long-term topics to compete and bid on projects at the provincial, ministerial and governmental level. Come to the seminar M.A. Le Tan Cuong expected enterprises to find the strengths of the university from which they connected and developed together in the industrial age nowadays. The workshop honorably welcomed Mr. Khemratch Amornwatpong - partnership manager of USAID-COMET as well as his presentation. He brought new insights from the USAID COMET project - a project of the United States Agency for International Development to assist countries funded in reforming Higher Education in the aim of training generations of students acquiring necessary skills and being ready to compete in the globalized labor market. In the workshop, M.A. Vu Tran Khanh Linh (Faculty of Chemical and Food Technology, HCM UTE) has also shown that the cooperation of enterprises with national universities in our country nowadays was mainly reflected by the idea contribution of enterprises to build training programs, creating conditions for students to visit and do internships, v.v. At the present, in Vietnam, the link between enterprises and universities was often short-term, only addressing demand-side issues and tending to connect through research contracts, consultancy and technology transfer agreements. Enterprises were not interested in building connections and investing in scientific research lastingly and strategically v.v for many reasons. Meanwhile, in developed countries, the connection between enterprise and university was more strategic. Specifically, enterprises and the university could cooperatively participate in the development of postgraduate programs, co-leading interns, and long-term research complexes to achieve technological breakthroughs. This long-term partnership would provide a multi-faceted platform that could enable enterprises to develop stronger, more sustainable innovative ability based on the capabilities, methods and facilities of universities. The university would also have a plentiful and stable source of funding for teaching and scientific research and the opportunity to publish research results that were groundbreaking and highly applicable. M.A. Linh assumed that enterprises needed to set long-term cooperation goals, because short-term goals often resulted in ineffectiveness; investing in graduate students and interns because this force possessed a wide range of skills and time to study v.v. Mr. Le Minh Trung, Director of HCM Business Support and Development, suggested that the university should have a database of experts and lecturers, thereby establishing an community of supporting experts in startup. This general system where students' ongoing researches were updated for enterprises to access easily was also for managing students who were about to graduate or already graduated. According to Mr. Trung, the enterprise expected the university to provide effective soft-skill training to students in which emphasizing appropriate manners not only in the university but also in the enterprise since behavioral culture in the corporate environment was far different from the university. Concurrently, focus on providing startup knowledge to students so that they knew where to find the output for the products and handled risks in reality v.v. In the presentation of the workshop, many enterprises gave their own opinions on the issue of linking university and enterprise in the present day. There was a proposal to build a Big Data database providing data on experts, project management teachers, graduates, undergraduates, course books, projects and students' products. This helps to bring enterprises closer to the students. Establish a Startup Support Center to support, connect, and develop students' startup thinking, thus helping students to fully develop their creative thinking skills. Since then, the school and enterprises soon discovered talents, human resources as well as startup ideas which were innovative and full of practicality. The seminar was ended by Signing Memorandum of Cooperation between HCM UTE and uong Minh Software Solution Co., Ltd, MISA Joint Stock Company, Binh Duong Wood Association, Vien Dong Energy Company. Giving the final presentation of the workshop, Assoc. Prof. Do Van Dung recognized the ideas, initiatives and contributions of enterprises, and from that the university and enterprises collaborate on the basis of win-win cooperation and co-development to adapt to the digital revolution in a global scale.